^ Andrade 1979, p. 65. ^ 2.0 2.1 Davis et al. 1978, p. 11. ^ 3.0 3.1 Carter 1958, p. 25. ^ 4.0 4.1 "Air Freighter." Time magazine, 18 May 1942. ^ 6.0 6.1 6.2 Johnson 2007, p. 45. ^ Johnson 2007, p. 44. ^ 8.0 8.1 8.2 Love 2003, p. 4. ^ Lucariny, J.R. "Curtis C-46 Commando." 互联网档案馆的存檔，存档日期2009-01-06. jrlucariny.com. Retrieved: 12 April 2012. ^ 10.0 10.1 Johnson 2007, p. 47. ^ 11.0 11.1 11.2 11.3 11.4 Mondey 2006, p. 72. ^ 12.0 12.1 Long, Everette. "Alaska's Senator Ted Stevens Recalls First Flight to Peking." 互联网档案馆的存檔，存档日期2010-01-12. Veterans Today, 2008. ^ Bolce, Don. "Operation Varsity." 互联网档案馆的存檔，存档日期2011-07-07. able506.com, 24 March 1945. ^ Seelinger, Matthew J. "Operation Varsity: The Last Airborne Deployment of World War II." 互联网档案馆的存檔，存档日期2010-12-01. The Army Historical Foundation. Retrieved: 11 May 2011. ^ Devlin 1979, p. 624. ^ Leeuw, Ruud. "Background Information: Curtiss C-46 "Commando." ruudleeuw.com. Retrieved: 11 May 2011. ^ "C-46 Nontransport Category Airplanes." FAA Part 121, Appendix C.
^ Adams, Capt E.G. "Memories of the Fall of Saigon - April 29, 1975 - Fred Walker's Diary: The Beginning of the End." 互联网档案馆的存檔，存档日期2011年7月20日，. air-america.org. Retrieved: 27 October 2011. ^ Groves 1994, p. 32. 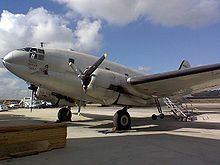 ^ "Buffalo Airways Fleet: C-46 Commando." 互联网档案馆的存檔，存档日期2011-05-04. buffaloairways.com, 2011. Retrieved: 11 May 2011. ^ Wiebe, Lindsey. "First Nations Transportation banned from flying: 20 people laid off while airline fights suspension." Winnipeg Free Press, 7 October 2009. ^ Hardesty 1991, p. 253 (Appendixes). Andrade, John M. US Military Aircraft Designations and Serials. Hinckley, Leicestershire, UK: Midland Counties Publications, 1979. ISBN 0-90459-721-0. Carter, John D. Chapter 1: The Air Transport Command. (编) Frank Craven, Wesley; Lea Cate, James. The Army Air Forces in World War II: Volume VII, Services Around the World 7. Hyperwar Foundation, 1958. Davis, John M., Harold G. Martin and John A. Whittle. 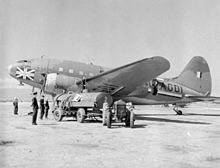 The Curtiss C-46 Commando. Tonbridge, Kent, UK: Air-Britain (Historians) Ltd., 1978. ISBN 0-85130-065-0. Devlin, Gerard M. Paratrooper! : The Saga Of Parachute And Glider Combat Troops During World War II. London: Robson Books, 1979. ISBN 0-31259-652-9. Groves, Clinton. Propliners: A Half-Century of the World's Great Propeller-Driven Airliners（Enthusiast Color Series）. Minneapolis, Minnesota: Zenith Press, 1994. ISBN 978-0879388669. Hardesty, Von. Red Phoenix: The Rise of Soviet Air Power 1941-1945. Washington, D.C.: Smithsonian Institution, First edition 1982, 1991. ISBN 0-87474-510-1. Johnson, E.R. "The Airliner that Went to War." Aviation History Vol. 18, no. 1, September 2007. Love, Terry. C-46 Commando in action. Carrollton, Texas: Squadron/Signal Publications, 2003. ISBN 0-89747-452-X. Mondey, David. The Hamlyn Concise Guide to American Aircraft of World War II. New York: Bounty Books, 2006. ISBN 978-0-7537-1461-4. Pereira, Aldo. Breve História da Aviação Comercial Brasileira（in Portuguese）. Rio de Janeiro: Europa, 1987. ISBN 978-8561936006. Background Information: Curtiss C-46 "Commando"